Posted in: Art, Flowers, Music, Photography. Tagged: 1911, Albert André, Nelson-Atkins Museum of Art, Post-Impressionism, Still Life with Oleander and Fruit, Tchaikovsky, Waltz of the Flowers. 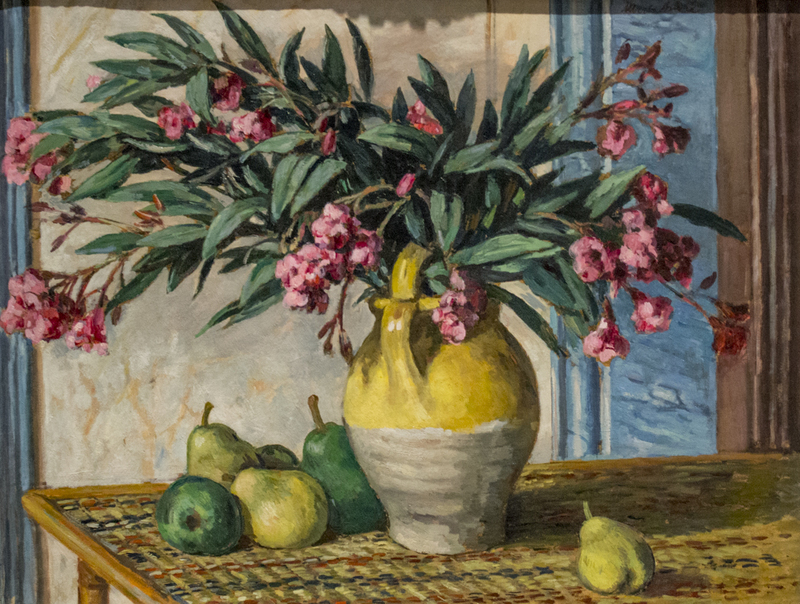 A sprawling bouquet of pink oleander spills from a rustic French Provençal ceramic vase in this casual and asymmetrically balanced still life. Yellow and green pears cluster at left, and a lone yellow pear rests on the tabletop at right. A brilliant flood of light illuminates the upper left side of all objects while casting shadows to the right. Together, the vitality of colors and composition suggest the pleasant comforts of home. Albert André began his artistic career as a fabric designer in Lyon. Later, living in Paris, he counted fellow artist Pierre-Auguste Renoir among his closest friends and mentors. Maverick, how many languages do you speak? :O I love this painting. I’m not a fan of still life in general, but the color and texture are great here. I want to reach out and smell the oleander and bite from a pear. Gorgeous! I adore still life.